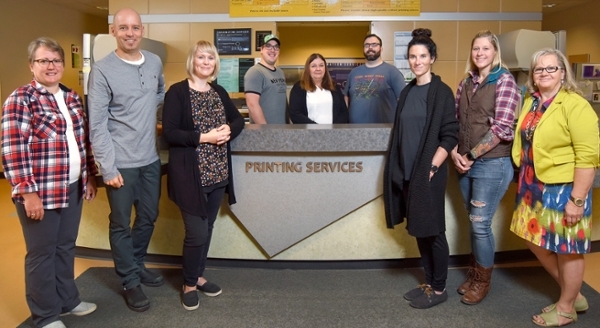 Printing Services provides a variety of print and document-related services as part of its support to the University community. We welcome all off campus customers and their business as well. To serve our customers as a print provider specialist by helping them achieve their goals through print and offering the best possible solutions to their needs. To be recognized by our customers as an integral partner in their goals to achieve their successes. For your convenience, Printing Services’ online order site offers a wide range of products including basic stationary, merchandise, uploading of your digital files and secure password encrypted upload for exams and confidential documents. Click on the link to take you to our storefront: Printing Services Online Orders. Through the Central Authentication Service (CAS) enter your novell user name and password to log in. Printing Services strives to provide services and products of high quality at affordable, competitive prices, with a consistent focus on customer satisfaction. We have a full service Photography Department offering a complete range of photographic services. Our experienced staff of photographers are dedicated to providing creative solutions for your communication requirements.